No one can deny the importance of cookware in every kitchen. It helps us turn those simple recipes into delicious, extraordinary ones. But with so many brands, types, and materials available, finding the right companion in your kitchen may consume much of your time and other resources. 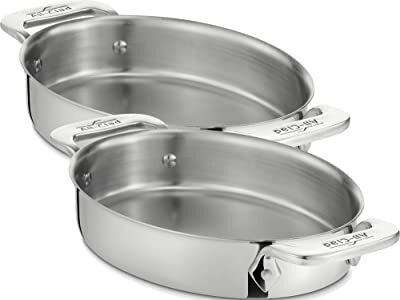 Our All-Clad cookware set review will give you some of the reliable products you may consider buying for your next purchase, along with buying guide to ensure you are really getting what you need for a cookware. Maybe some of you are still not very much familiar with this cookware brand. If so, allow me to share with you a bit of information. 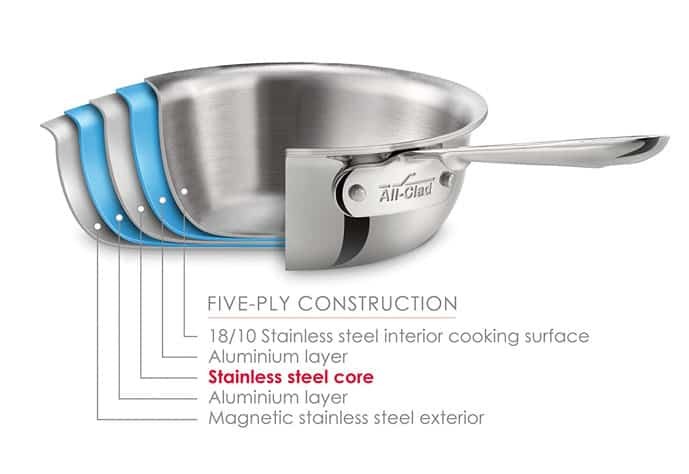 All-Clad is an American cookware company located in Pennsylvania. You may ask, “what the term ‘clad’?” Pretty simple. In the term of metal-crafting, cladding denotes to coating a single metal with a sheet of another metal. The cookware is often clad so the softer, lighter aluminum within will be protected. 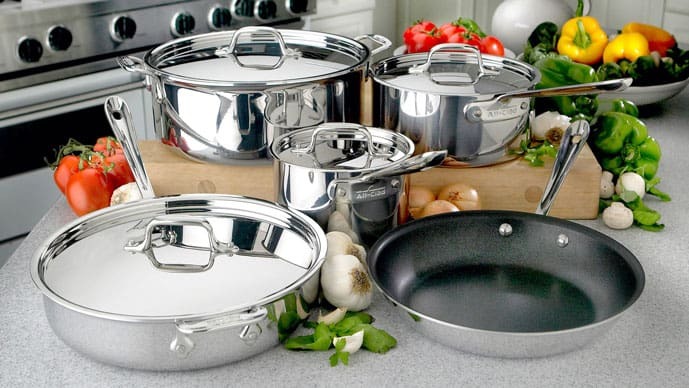 Almost all All-Clad cookware is highly popular for their stylish looks, durability, and performance, although expensive. How does this kitchen accessory perform? One of the nice things about cookware made by All-Cad is that it works well as well as dishwasher-safe, oven-safe, and is not induction compatible. Many users love its ruggedness, quality, and versatility. A less-maintenance, heavy-duty item for typical home cooks that will last a lifetime! 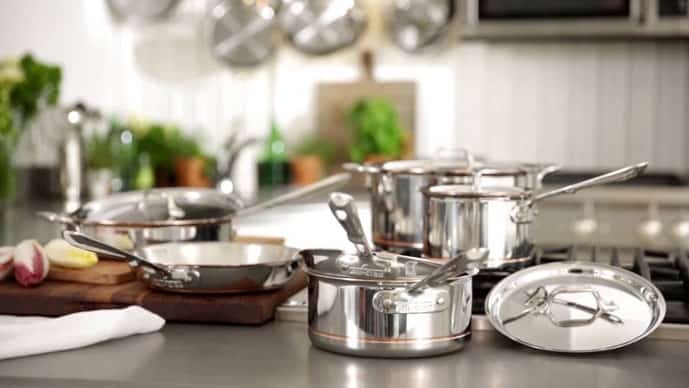 Stainless Steel: The most famous collection of All-Clad, stainless steel cookware features a bonded 3-ply built – 18/10 stainless steel cooking surface, induction stainless steel exterior, and aluminum core. Though more cost-efficient than the copper line, it still proves to be high in quality. What’s more, stainless is immune to the foods’ acids. Copper Core: Another All-Clad’s top line product, copper core cookware has a bonded 5-ply clad built – aluminum layer, 18/10 stainless steel interior cooking surface, and magnetic stainless steel exterior. Unlike stainless, it does the job of distributing heat equally all through the pan without worrying about hot spots. Easier to care and firmer! What makes All-Clad Cookware so great? Honestly speaking, the All-Clad pans and pots are among the best cookware I’ve ever used. Even many other cooks and reviewers tell the same. Like everyone else, I was hesitant at first because of its high price. But curiosity killed me, so I eventually found myself buying a set for my future cooking endeavors. Here are the essential reasons why I recommend All-Cad’s products. All-Clad constructs their cookware with high-grade copper core and stainless steel. All of their materials are tested and assured to meet ASTM standards. PFOA-free and non-toxic, the cookware is sure to lure your interest. The heat is evenly distributed all through the food plus the pan is prepared quickly and consistently. Hence, your persistent time will be saved. The cookware is not prone to discolouration, breaking, or destroying. It will also not scratch or damage. You don’t even have to worry about pan’s pollutants that engage in your delicious meal. The cladding or bonding process involves numerous layers of copper, purr aluminum, and stainless steel. This promotes accurate temperature control and even heating. Homeowners are given a complete assurance that the pan or pot will not enter in the foods or chip off. Hence, metal poisoning is far from the concern. Since the cookware has a dishwasher-safe feature, cleaning is a just a breeze! You can expect your cookware to look like new for numerous years since it consists of a dime (a good type of metal that aids in keeping a refined new appearance). All the materials used for making the cookware are sourced from US suppliers. Durability is what you will initially feel once you pick an All-Clad pan and pot. Each is built to last for a lifetime. Enjoy fantastic and nutritious meals! At some point in our lives, we’ve experienced losing our appetite because of the strange smell or taste of our meal coming from the pot or pan. Well, this is not the case with All-Clad cookware sets. Cooking and eating the food is such pleasurable! So, say yes to tastier and healthier foods all the time! Now, the next step is finding the right set of cookware. How? Refer to the guide below. Stainless steel or copper core? Both have their benefits and drawbacks. Stainless is easy to clean, compatible with any cooktops, ensures short cooking times, and is perfect for everyday cooking. However, it is a bit pricey. Copper cookware, on the other hand, is visually appealing, has excellent heat conductivity, and ideal weight. Though it is extremely reactive, and high maintenance may be needed. Are you looking to cook just for two people or more than that? It is also an essential factor to bear in mind. A good cookware set should include a saucepan, a stock pot, and a frying pan. This one is just simple to assess. Individuals who live alone or with small families may opt for quite a small scale, while larger sizes are for larger families. When it comes to the cookware’s weight, that solely depends on your personal preference. A comfortable weight is good for people on-the-go. All-Clad cookware set nonstick is said to be easier to clean as there’s no learning curve involved in cleaning it compared to not nonstick pots or pans. Is it microwave, oven, and dishwasher safe? Can it be easily used on induction tops, gas stoves, and halogen tops? Research carefully before making a final buying decision to avoid qualms later. All of us are conscious of what exactly we are eating, and getting poisoned by toxins is one of our nightmares. 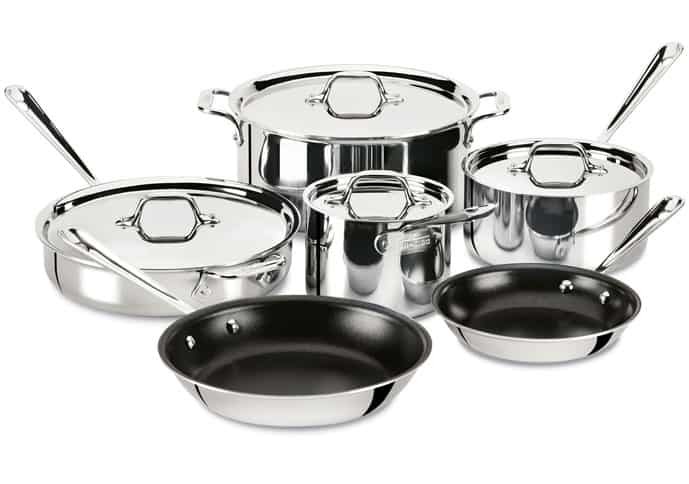 Therefore, before picking a particular set of cookware, check if it is non-toxic and free from PFOA and cadmium. And for the reviews of the best products out today, here we go! Made with durability and versatility in mind, the All-Clad BD005710-R has patented technology to allow even and slow heat for a perfectly cooked protein and food of any type. It includes 1 Qt. 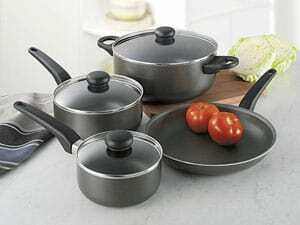 sauté pan and stock pan with lid, a pair of saucepans, and two frying pans (8-inch and 10-inch). The cookware features a stylish fingerprint-free covered stainless exterior, plus it provides natural adhere-resistance and hinders the food from getting a metallic taste. Long lasting use is guaranteed. You can use it whether for boiling, sautéing, baking, frying, and simmering. Though on the negative side, the All-Clad BD005710-R is costly. The pans are a bit heavy and have a tendency to get stained when used under high heat. If you’re in the market for All-Clad cookware with non-stick coating, the All-Clad 410810 NSR2 can instantly become your best friend! Its shape proves to be an excellent addition to your kitchen. Suitable for heating the liquids, making sauces, cooking foods in the water as well as reheating. It has a small surface area and high and straight sides which helps in limiting the evaporation and holding well the heat. Use it with or without lids to easily control evaporation. Another expensive All-Clad collection we have in the list. It may break over time especially when not correctly used. So, we recommend it to use according to its primary functions in order to ensure long-term usage. If we are going to talk about All-Clad cookware that is premium in quality, we must say the All-Clad 59900 also tops the list. It comes in a measurement of around 7 x 5-1/2 x 1/2 inches, which is an ideal size if you are fond of baking cheese and macaroni for quick single serving ideas or a party of four pax. This cookware set is built from the highest quality 18/10 stainless steel; hence, even cooking and superior distribution of heat can be expected. Even if it is heating up leftover foods or cooking small meal portions, the All-Clad 59900 prove to be a good solution. The food will not stick to the cookware as long as you preheat it with some oil or butter. Although, the cookware may give you a thin and fragile look, plus the size may be as small as anticipated. So, you’re in search of the best cookware for your future special event. Don’t panic! The All-Clad E849B264 could be what you’re looking for! Use it for cooking and serving your signature dishes! The good news is that you don’t have to spend too many bucks to get cookware set that will fit your needs. From construction to functionality to price – All-Clad E849B264 is set to impress you. This dishwasher-safe cookware is perfect for daily use with traditional gas or electric ranges. The All-Clad E849B264, however, is not induction compatible. Okay, the All-Clad 600822 is one of the relatively expensive models you will find out there, but man, it is incredibly worth every penny. Built to last, easy to clean, incredible heat condition, and so much more – what’s not to love about this product, really? The All-Clad E849B264 cookware includes 10″ and 8″ fry pans, 8 quarts covered stockpot, 3 quarts covered sauté pan, as well as 2 and 3 quarts, covered saucepan. Reliable responsiveness, warp-free strength, and uniform heating are assured thanks to its 5-ply bonded built with a thick copper core, stainless steel, and aluminum. The drawback, however, is that this cookware set has an uncomfortable handle and a high price point. I’m glad I was able to do the All-Clad cookware set review. If there’s one product that has sturdiness like a tank, worth the dollars, and is phenomenal, I’d go to All-Clad BD005710-R D5 10-Piece Brushed Stainless Steel, though all of these products deserve recognition. Hurry, get your All-Clad cookware set Bed Bath and Beyond now before it lasts!